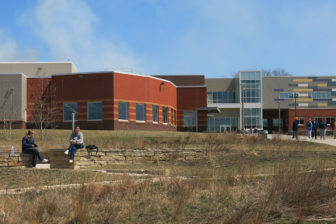 Logan Correctional Center in Lincoln, Illinois, held about 1,750 female inmates as of July 2018. During her twenty years in an Illinois prison, Monica Cosby received disciplinary tickets and was sent to solitary confinement more times than she can remember. And she wasn’t alone. This investigation is a collaboration between The Chicago Reporter, NPR News Investigations, and the Social Justice News Nexus at Northwestern University. Sometimes, Cosby got in trouble for breaking rules that she thought she was following — like the time she picked up an extra shift working in the kitchen. Cosby says she got permission, but a correctional officer still issued her a ticket for unauthorized movement and put her in solitary for 60 days. More often, Cosby says she was punished not for things she did, but for things she said — like the time she got in trouble while quietly playing Scrabble by herself. When a correctional officer asked her what she was doing, she gave him attitude. “What does it look like I’m doing?” she replied. “Out of 20 years of me locked up, I think there’s only like three people that I know that never got a ticket for insolence,” she said. The Illinois Department of Corrections denied our request for Cosby’s disciplinary records, citing an Illinois law. But an investigation by The Chicago Reporter, the Medill School of Journalism at Northwestern University and NPR has found that women in Illinois — and in prisons across the country — are disciplined at significantly higher rates than male inmates for mostly minor, subjective infractions. We analyzed data from fifteen states that track discipline by gender, visited four different prison systems, and interviewed dozens of current and formerly incarcerated women, academics, and prison staff. We determined that although female inmates are less likely than their male counterparts to act out violently in prison, they receive more disciplinary tickets for minor offenses — matters that are unlikely to compromise safety. Experts say that this disparity stems in part from women’s attempts to cope with the lingering effects of trauma in an environment that exacerbates it. Though women comprise less than 10 percent of all prison inmates, their numbers have grown eight-fold over the past 40 years. In an effort to better manage this population, and as part of a movement known as “gender-responsive” corrections, officials have slowly begun to adjust their needs assessments, case management protocols, and substance abuse treatments. However, most if not all of those efforts have yet to change the stark disparity in how women behind bars are disciplined. The effects of these disparities have far-reaching and enduring effects on families and communities: women are often primary caregivers, and many are also primary breadwinners. More than half of imprisoned women across the country are mothers. To better understand this problem in Illinois and nationally, The Chicago Reporter and NPR filed Freedom of Information Act requests for disciplinary data with 26 state correctional agencies. Eleven states either charged high fees for the data or said they don’t keep it. But almost all of the fifteen states that supplied data from 2016 and 2017 revealed the same pattern: women in U.S. prisons are being disciplined at higher rates than men, sometimes exponentially so, for lower-level offenses. With more than 42 insolence infractions for every 100 inmates, women in Illinois prisons are cited at a rate nearly twice as high as their male counterparts (22 per 100). Insolence is the most common infraction in Illinois women’s prisons, accounting for nearly one out of every five disciplinary cases. This graphic depicts the average rate of insolence infractions per 100 inmates by gender. Our analysis also revealed that the punishment meted out for these low-level infractions are often more harsh for female inmates. Women in Rhode Island prisons were more than three times as likely to be placed in restrictive housing for “disobedience.” In Idaho prisons, although men are more likely to assault both staff and inmates, women are more likely to be put in physical restraints. And in California, women were more likely to have their phone privileges revoked, a punishment that not only affects a woman, but her children. In many states, infractions are also punished by revoking “good conduct credit” that would shorten an inmate’s sentence, causing them to serve more time. In California, between 2016 and 2018, women inmates had almost a day per week on average of good conduct credit revoked, a higher rate than their male counterparts. In Illinois, women lost a total of 93 years through good credit revocation in 2015 alone. 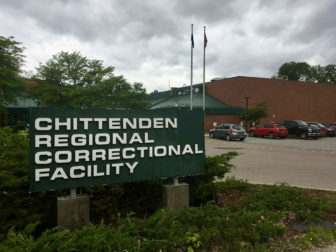 The Illinois Department of Corrections did not provide data on male inmates, but data on female inmates obtained through a FOIA request showed some of the incidents that resulted in the revocations for female inmates: 90 days for grabbing a staffer’s arm, 60 days for refusing to change cells or cellmates, 30 days for making a threat. Maggie Burke, former warden of Illinois’ largest female prison, said that prisons fail women. Officers write “emotional tickets,” she said, based on their “anger and frustration” with the inmates. 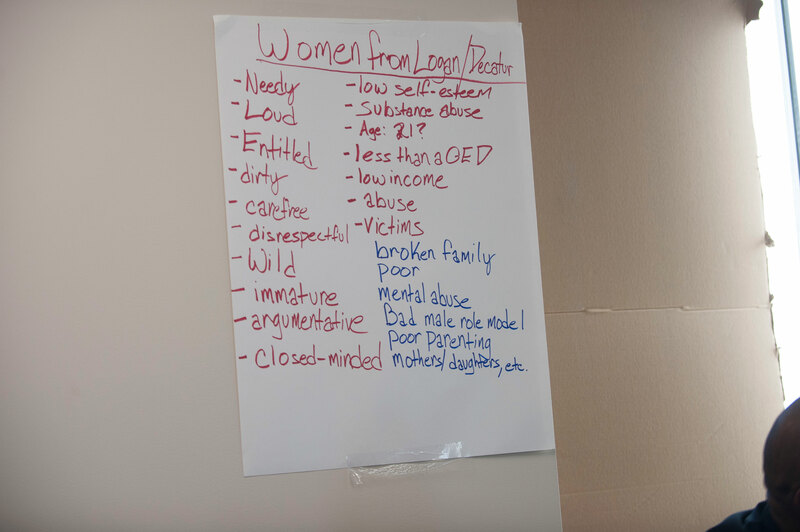 A sheet lists biases that correctional officers have towards female inmates going into a training for correctional officers at Logan Correctional Center on March 15, 2018. Criminality among women has long been seen as a particular affront to social order. While male outlaws in popular culture are often romanticized, women are instead met with contempt. These attitudes have long been documented in prison records. As far back as 1845 prison administrators in Illinois considered female inmates more disruptive and difficult to manage, according to research by L. Mara Dodge, a professor at Westfield State University in Massachusetts. Dodge also analyzed inmate records from the State Reformatory for Women in Dwight, Illinois, from 1954 to 1967. She found that the top three rule violations among female inmates were talking loudly, disrespect to staff, and lateness. Women were also disciplined for “language unbecoming a lady,” hanging wet towels in the wrong place, and eating too much or too little (one ticket was issued for “failure to eat all of her French toast”). “In prison as in the free world women were, and are, expected to acquiesce to a level of social control that would be deemed unacceptable by men,” she concluded. In the 1980s, Texas A&M University professor Dorothy McClellan examined disciplinary practices at men’s and women’s prisons in Texas and found what she called “two distinct institutional forms of surveillance and control.” Women received far more disciplinary tickets than men, mostly for low-level, non-violent offenses. Women were also more likely than men to be severely punished for these infractions, McClellan found, including more time in solitary confinement and harsher restrictions during family visits. Unlike male inmates, if women had received a ticket for any infraction in the past month, they would be denied their bimonthly, five-minute call home or be limited to no-contact visits with their children. Since that time, a handful of states — including Illinois, Michigan, Iowa, California and Vermont — have instituted reforms. They have adjusted their intake processes and risk assessments. They have hired more women in a field still dominated by men, and promoted more of them to leadership positions. But the data shows they have not made significant strides in changing the way that discipline is meted out in women’s facilities — a challenge that experts say is crucial to avoid retraumatization and help women succeed once they are released. Women at Logan Correctional Center had access to only one vocational program, nail technician training, last March. Twelve women out of about 1,750 inmates were enrolled in the program, according to state data. A female inmate plays a game of cards at Logan Correctional Center in Lincoln, Illinois, on March 14, 2018. Female inmates play Scrabble at Logan Correctional Center in Lincoln, Illinois, on March 15, 2018. Female prison populations across the country have in common high rates of past physical and sexual abuse. A 2010 study by Illinois found that 98 percent of women behind bars in the state had experienced physical abuse before incarceration, and 75 percent had been victims of sexual abuse. Recent research found that between 61 and 83 percent of incarcerated women in Illinois exhibit symptoms of post-traumatic stress disorder. That is three times more than incarcerated men. It is also higher than any other studied demographic, including combat veterans. These figures mirror studies in other states and in the federal prison system. Advocates like Benedict say the growing body of research on trauma ought to be tapped to help develop correctional systems that allow incarcerated women to rehabilitate and recover. Instead, many common aspects of prison life — including strip-searches, verbal abuse, restraints, and isolation — exacerbate trauma’s lingering effects. For example, research on trauma has found that, in order to work through PTSD, survivors need to experience safety and consistency. But traditional prison environments are wholly unpredictable, interrupted at any time by spontaneous lockdowns, shakedowns, and strip searches. “If you have them storming in your room, and that’s like the only space you have, and that’s constantly invaded and looked through…It hurts you mentally and emotionally, so much that it actually causes physical pain,” said Monica Cosby, who was released in 2015. Trauma survivors also need to form relationships built on trust. But several former inmates and their advocates said that in women’s prisons, close relationships can be criminalized. Maria Moon, who spent 13 years in Illinois prisons, said she got more than one ticket for “sexual contact” for what she said was simply showing non-sexual affection towards friends. “You might be trying to console them because they had a death in the family, or they miss their children. It’s just what human beings do, but they look at it as sexual,” she said. People who have experienced trauma also need to feel empowered. But many women interviewed for this story instead report being disrespected and demeaned by prison staff. Cosby says that the default techniques used by correctional officers to control inmates can also have a triggering effect — and can lead to disciplinary infractions. “If I tried to leave [and] he grabs me and I tried to pull away, that’s a staff assault. I assaulted him. And now I’m seg,” Cosby said. 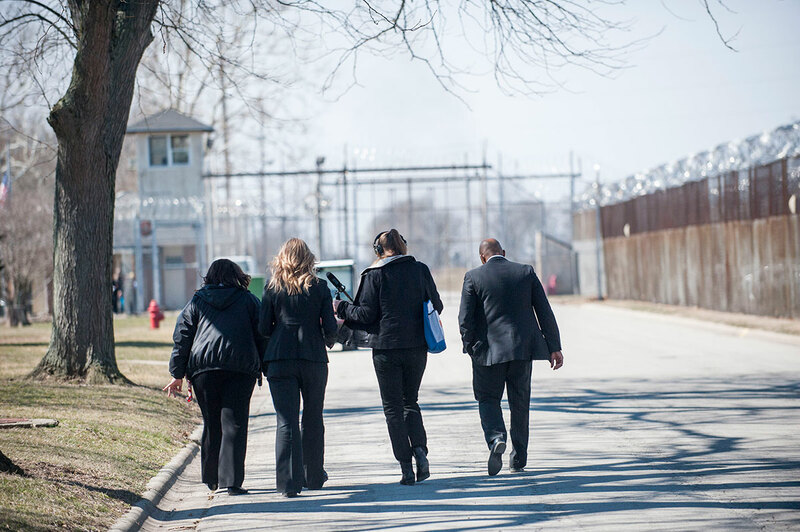 Illinois Department of Corrections officials, Public Information Officer Lindsay Hess, Women’s Division Chief Carolyn Gurski, and Warden Glen Austin, right, walk the grounds at Logan Correctional Center with reporter Jessica Pupovac, second from right. Even when research is available, the road to reform can be obstructed by politics and haphazard planning. In 2010, in a cost-cutting move, Illinois closed its Women’s Division, which oversaw gender-specific programming. Then in 2013, in another effort aimed at saving money, the inmates at the state’s two largest women’s facilities were moved into Logan Correctional Center, previously a men’s facility. Staff, used to working with men, were not prepared to work with women and many of them resented the changes. 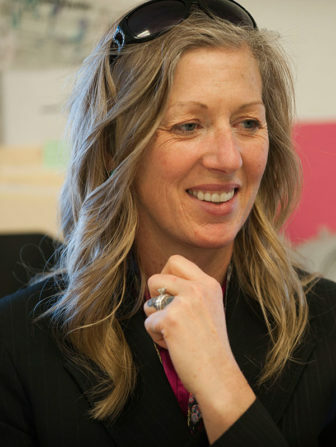 The following year, Deanne Benos, the former assistant director of IDOC, co-founded a non-profit called the Women’s Justice Initiative with Benedict in an attempt to transform correctional services for women. They partnered with the National Resource Center on Justice Involved Women and IDOC to launch an in-depth study of gender-responsive practices at Logan. “Segregation and other highly punitive responses are being overused despite the reality that these practices can trigger trauma, create the troubling behaviors they are designed to eliminate, and fail to create long-term behavior change,” the report concluded. Illinois State Rep. Juliana Stratton (5th District), who then ran the Center for Public Safety and Justice at the University of Illinois at Chicago, was part of Benos and Benedict’s assessment team. Soon after the report’s release, she was sworn into the General Assembly. She quickly sponsored a bill, drafted by Benos and Benedict, to re-establish the Women’s Correctional Services Division — only this time, the division would be run by a chief trained in gender-responsive and trauma-informed corrections, with a legislative mandate to reform the way the state disciplines female inmates. In June 2017 a bill was passed, although the mandate to reform discipline and sanctions was stripped out after opposition from the correctional officers’ union. Even without a mandate, then-Acting Warden Maggie Burke began making changes. She reviewed every ticket and every stay in solitary, and reduced the sanctions whenever she thought it was appropriate. She also tried to change what she saw as a lack of training in communication skills and a department-wide over-emphasis on firearms training and physical confrontation. Burke received pushback from correctional officers, some of whom held a demonstration outside the prison, pointing to a spike in inmate-on-officer attacks. Data obtained by the Reporter backed up those claims, but showed that male inmates were also assaulting officers at higher rates. Burke said it was precisely the officers’ well-being she was concerned about when she implemented reforms. When she was coordinator of Women and Family Services for IDOC, part of her job was to review video footage of women being forcibly removed from their cell. Three months after Illinois’ Women’s Correctional Services Act was signed into law by Governor Bruce Rauner in 2017, advocates and formerly incarcerated women gathered at a homeless services organization in Chicago for a press conference. They touted the progress they said had already been made. She highlighted changes in the disciplining of incarcerated women that had occurred in the past year and a half, since the 2016 audit. The number of women in segregation had dropped by half. (Compliance with a consent decree on the use of segregation may have also influenced those numbers.) And in the first six months of 2017, women had lost only 2,660 days of good credit, compared to 18,830 during the same time period in 2015, just prior to the audit. For these changes, the speakers gave much credit to Burke. “A year ago I stood in front of everyone and said, ‘We can do things better.’ And for the last year we have done things better,” Burke told the small crowd. But just weeks later, Burke told colleagues’ of her decision to retire. She told the Reporter that she had put off retirement for a while, and with the bill’s passage, she decided it was time. She has since been replaced by Glen Austin, who has been with IDOC for more than a decade. Despite multiple email requests, the department declined to provide information about any training he might have in gender-responsive corrections. Since Burke’s retirement, systemwide reform has fallen largely to Carolyn Gurski, a three-decade IDOC veteran who in January 2018 was appointed Illinois’ new Women’s Division chief. Gurski talks with a slight Southern Illinois twang as she explains that, when she first became a correctional officer in 1989, she received “no training” on working with female offenders. “I didn’t even think about women being in prison, to be honest, in the academy,” she said. Now, training is crucial to the changes that Gurski wants to make. The department recently added four hours of training on working with female inmates in their six-week academy. And all new correctional officers assigned to a female facility now go through a week-long training, designed by Benedict, where they learn more about women’s typical backgrounds, needs and communication styles. Since 2017, more than 200 Illinois correctional staff have received the training. It’s a significant number, but still only a small fraction of the total workforce at Logan, which exceeds 700 people. Trainer Tiona Farrington stood in front of the class, telling officers about the importance of de-escalating conflicts and imagining the perspective of the inmate. She stressed the need to take a deep breath and stay calm. And she told them to remember the key elements of any trauma-informed environment: safety, trust, collaboration, and empowerment. Despite multiple requests, the Illinois Department of Corrections declined to provide data that would demonstrate whether they’ve reduced the number of low-level tickets and sanctions — other than segregation — for their female inmate population since the 2015 audit. After spending twenty years in an Illinois prison, Monica Cosby became a community organizer at the Westside Justice Center in Chicago. Since leaving Logan Correctional Center three years ago, Monica Cosby has been working on reconnecting with her three adult daughters — who were one, four, and seven when she was incarcerated. She’s also fighting for the women she left behind. 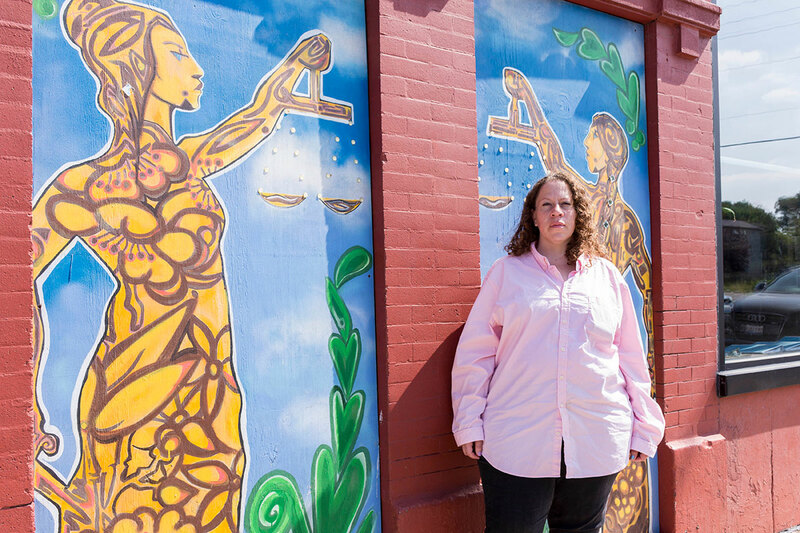 She’s become an outspoken activist, demanding better services for incarcerated and returning women. And she’s part of a new Statewide Women’s Justice Taskforce, which is monitoring the reforms required by Illinois’ new law. 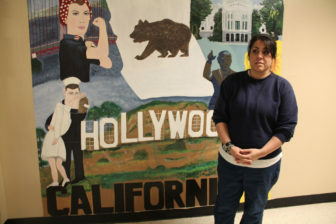 She added that she believes it will take more than laws and training to change the experiences of incarcerated women. Joe Shapiro at NPR and Northwestern journalism graduate students Sydney Boles, Natalya Carrico and Cailin Crowe contributed reporting. Robert Benincasa of NPR and Matt Kiefer of The Chicago Reporter provided data support. Freelance reporter Jessica Pupovac received additional support from Illinois Humanities, with support from the MacArthur Foundation’s Safety and Justice Challenge. METHODOLOGY: To research this story, we submitted open records requests to departments of corrections in 26 states, asking for any and all data they collected, by institution and/or gender, documenting discipline and sanctions in 2016 and/or 2017. We also asked for the corresponding population data for whichever time frame they supplied. Fifteen states responded with data sets that fulfilled our request in part or entirely. Different states sometimes used different ways of counting prisoners and punishments. We used the data states provided to divide the number of punishments by the number of inmates in order to estimate rates of discipline for men and women. Download the data and documentation. Jessica Pupovac is a Chicago-based freelance reporter and producer who specializes in covering the environment, criminal justice, and women’s issues. Her work has been featured on NPR and in the Chicago Reader and WTTW.com. Why can’t I email this story to myself? Another Progressive Socialist Far Left Feminist B.S. garbage!